When was the last time that a metal band hit the kind of roll that Mastodon have been on for the last 15 years? Five albums and each one more or less as stellar as the other. Leviathan will likely remain the shimmering jewel in the crown while Crack the Skye will be their most ambitious and The Hunter will be considered a brave but ultimately rewarding swerve away from proggier tendencies. So what now? On Crack the Skye they pushed their songwriting to the absolute limit and it paid dividends. With The Hunter they recoiled into an unabashedly hookier-driven record that was peppered with traits that Torche would dig. 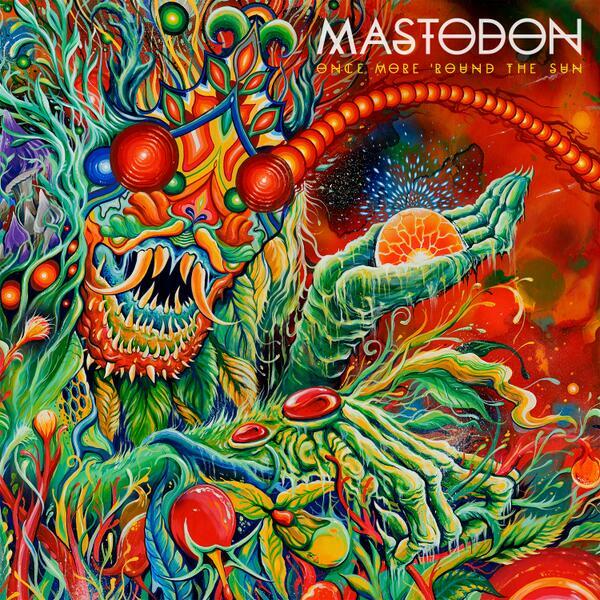 Sixth record Once More ‘Round the Sun poses many questions for Mastodon like which direction at this crossroads do they take? Once More ‘Round the Sun lies closer to The Hunter end of the scale but with some carefully placed nods to earlier works. The band has greatly expanded on their vocal departments, spreading out the work load more than ever before, one need only listen to the opening one-two of ‘Tread Lightly’ and ‘The Motherload’, the latter of which is an early highlight and marks a significant evolution for Brann Dailor as a lead vocalist. The album is off to a good start then. Perhaps the closest thing to a weak link in the chain is ‘High Road’. Strangely, it was released as the lead single and while the online whines would have you believe it’s a terrible song, it’s actually still a solid tune just with an overly clean chorus that feels tacked on. When compared to the rest of the album, it’s a red herring and stands out for the wrong reasons and disrupts the flow, if only just a little. Things get moving strongly again almost instantly with the title track and the vocal duelling of ‘Asleep in the Deep’. This certainly is a vibrant and colourful record (the stunning artwork more than sets this tone), working with many different shades to Mastodon’s palette like ‘Aunt Lisa’, which is shamelessly poppy featuring chirpy gang vocal lines of “hey ho, let’s go”, courtesy of fellow Atlanta natives The Coat Hangers. That isn’t to say Once More ‘Round the Sun doesn’t have a duskier side or cast any shadows. Album closer, ‘Diamond in the Witch House’, which contains the obvious Scott Kelly collaboration, is a drearier and more lethargic outing, glossed with sludgy undertones, with the kind of grit and disdain that only Kelly could provide in his vocals, making for an oddly compelling way to end the record considering everything what came before it. Once More ‘Round the Sun, thankfully, isn’t a safe record, which is something that Mastodon could easily have done. Granted, it doesn’t conjure the same kind of majesty as Crack the Skye or Leviathan mostly because, to the best of our knowledge, it doesn’t tackle a lofty and overarching concept like its predecessors. What is safe to say however is that Once ‘More Round the Sun, much like The Hunter, is an unavoidably infectious record and quite accessible, making it yet another triumph for Mastodon. The roll continues. Tags: Mastodon. Bookmark the permalink.